Australia is exposed to natural disasters that impact infrastructure, essential services and communities. Over the past 30 years, these disasters have resulted in billions of dollars in tangible costs, as well as intangible costs such as deaths, injuries and other social impacts, including on health and wellbeing. More than 9 million people have been affected by both immediate and, for some, long-term effects. When combined, the total economic cost of natural disasters in the 10 years to 2016 has averaged $18.2 billion per year, equivalent to 1.2% of average gross domestic product (GDP) over the same period. This is expected reach $39 billion per year on average by 2050 (in present value terms), even without considering the impact of climate change. What's driving the increased cost? 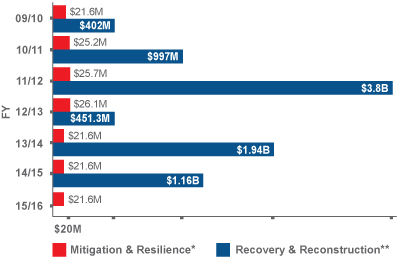 There are a number of factors contributing to the increased economic and community impact of natural disasters. Population density is increasing generally, with concentrations emerging in areas prone to natural disasters, particularly coastal areas. Around 80% of Australia’s population lives within 50km of the coast. One quarter of Australia’s population growth is within 3km of the coastline. These population centres are exposed to some of the most damaging extreme weather events, such as tropical cyclones, storm surges, hailstorms and coastal river flooding. More property in these areas means a higher cost of damage from natural disasters. A lack of national, comprehensive data and mapping has undermined understanding of natural hazard risk by governments and the community. This has contributed to poor planning decisions leading to property development in areas of significant risk. Inappropriate building design and construction has been widespread, leading to a built environment susceptible to damage. Local, state and national governments have not invested adequately in strategic disaster mitigation initiatives and infrastructure. Potential changes in climate is likely to lead to further increases in the frequency and severity of weather related losses in Australia. Without appropriate risk assessment, mitigation and adaptation measures to offset these uncertainties, the cost of insurance is very likely to rise, with some locations becoming too expensive for consumers to bear the cost or causing some insurers to withdraw. As this occurs, governments will be called upon to cover the cost of repair and reconstruction currently met by insurers. Our national perspective on natural hazards has historically focussed on responding and rebuilding after an event rather than preparation and mitigation. There is a need, however, to shift some of this focus to adapting to extreme weather events. This includes embedding a consideration of resilience in design and building planning processes to ensure more resilient infrastructure is given adequate importance in initial investment stages. It also includes stronger building codes to protect structures from hazards, more risk appropriate use of land, better incentives for both the private and public sector to invest in resilient infrastructure and better capacity to deliver it. To better equip our communities to withstand catastrophes, investment in disaster mitigation and resilient strategies must increase. The emergency management community generally accepts that one dollar spent on mitigation can save at least two dollars in recovery costs. Natural disasters can impose major fiscal shocks on government budgets. Meanwhile, the flow-on effects of disasters for businesses and communities can dampen state economies over the medium to longer term. Government interest and activity in the area of disaster reliance has increased. Yet the economic and political investment of all three levels of Government remains well short of what is required to seriously tackle both the existing and potential future impact. Improved land-use planning: Commitment by Government to develop national land-use planning criteria that prohibits inappropriate land-use in Australia. Improved building standards: Commitment by Government to improve the community's disaster resilience by modernising the Building Code of Australia to include minimum standards for the durability of property to natural hazards. Improved community infrastructure: Recovery funds dedicated to preventative infrastructure projects including barrages for unusual tides, levee banks, sea walls, properly maintained fire breaks and access trails, improved drainage and dams. Improved infrastructure planning processes: Integrate resilience in government and industry decision-making by adopting the five principles laid out by the Roundtable in Building Resilient Infrastructure (2016). Improve incentives: Prioritise policy changes and funding arrangements that ensure resilience has been considered and incorporated into infrastructure planning. Improve capacity: Work to strengthen the technical capacity of practitioners to identify, analyse and evaluate the costs and benefits of resilience options.